“Wacky” Ben Pul­liam is the host of Ben’s Wacky Radio. After becom­ing a Dr. Demen­to fan at age 15 he had hopes that he could fol­low in the good doctor’s foot­steps and host his very own com­e­dy music show; in Jan­u­ary 2004, he got his chance at sta­tion WQNA 88.3 The Edge in Spring­field, IL where he has been bring­ing out the wack­i­ness to the lis­ten­ers for 10 years. The wack­i­ness of Ben’s Wacky Radio can still be heard every Tues­day on madmusic.com and Wednes­day evenings on dementiaradio.org. And when you tune into the show, Wacky Ben always reminds his lis­ten­ers to NOT break their fun­ny bones! 2014 marks the 10th year the “mad­man on the loose” has been broad­cast­ing on Demen­tia Radio. His first expo­sure to demen­tia was lis­ten­ing to Spike Jones records at his uncle’s house in the 1970s before as a high school stu­dent dis­cov­er­ing the Dr. Demen­to Show in the ear­ly 1980s. Once he joined the Demen­tia Radio group in 2000, he helped fel­low fans and artists get to con­ven­tions and once there assist­ed with every­thing from mer­chan­dise sales to haul­ing equip­ment to occa­sion­al­ly appear­ing on stage. Over the past decade, Ken has made cameos in many songs and videos includ­ing “The Mall San­ta”, which he co-wrote as well as voiced the title char­ac­ter. Chozo Nin­po is the cre­ator and project man­ag­er for the Orlan­do Nerd Fest (http://orlandonerdfest.com). He has been help­ing to pro­mote nerd cul­ture in the pub­lic eye for over a decade. He first start­ed out as a rave and par­ty pro­mot­er and even­tu­al­ly became a nerd­core rap­per, and per­formed at Ner­da­palooza 2008. Dur­ing his time he was also exec­u­tive pro­duc­er of sev­er­al of the “Rhymetor­rents” albums, which were com­pi­la­tions to help fur­ther the “nerd­core hiphop” genre. He even­tu­al­ly put his music career on hold to run Chan­nel Zero (http://thezerolevel.com), a WebTV site based on “the nerdy and nos­tal­gic”. It is there that his cohort Shamus Odd­ish and he review movies, play video games, and cov­er var­i­ous live nerd relat­ed events. He has since brought on board sev­er­al oth­er media pro­duc­ers from all over the world. At Dragon*Con 2004, Dr. Demen­to declared “the great Luke Ski” to be his radio program’s “Most Request­ed Artist of the 21st Cen­tu­ry”. Since then, Luke held onto that title by hav­ing songs on “The Dr. Demen­to Show’s” annu­al year-end “Fun­ny 25” count­down of his most request­ed songs of the year for twelve years in a row, includ­ing three of them at #1 (“Peter Park­er” 2002, “Steal­ing Like A Hob­bit” 2003, “Snoopy The Dogg” 2011), and two of them at #2 (“You Don’t Know Jack” 2006, “Too Much Stuff” 2009). His song par­o­dies, orig­i­nals, stand-up and sketch­es about pop cul­ture phe­nom­e­na have made him a favorite per­former at sci­ence-fic­tion and fan­dom con­ven­tions all across the mid­west and beyond. He’s released ten albums and a DVD over the past sev­en­teen years, many of which fea­ture col­lab­o­ra­tions and cameos by his fel­low com­e­dy musi­cians of the Fun­ny Music Project (www.theFuMP.com). Luke is a 3-time Logan Awards nom­i­nee, and a 2-time win­ner for Out­stand­ing Par­o­dy Song for “Snoopy The Dogg” in 2012, and “When You Wish Upon A Death Star” in 2013. Kevin Eldridge dis­cov­ered The Dr. Demen­to Show in the ear­ly 80s, and became quite obsessed with fun­ny music; his first con­cert was “Weird Al” Yankovic in 1985. In the ear­ly 90s, Kevin formed the com­e­dy band The Sponge Aware­ness Foun­da­tion with key­boardist Ed Lecuy­er, and released the album “Looks Like Rain… Tastes Like Chick­en”. Sev­er­al SAF songs have been heard on The Dr. Demen­to Show; most notably, “An Axl Christ­mas” was a hol­i­day favorite on the show through­out the 90s and beyond. The Sponge Aware­ness Foun­da­tion per­formed at col­leges and cof­fee­hous­es through­out New Eng­land, and appeared at the Demen­tia 2001 con­ven­tion in Michi­gan. Also in 2001, SAF released the Delu­sions of Com­pe­tence album, fea­tur­ing the song “Greg Brady Wants Me Dead.” The band still resur­faces occa­sion­al­ly to per­form their weird orig­i­nal songs, as well as cov­ers such as their School House Rock med­ley. These days Kevin can also be heard on a week­ly com­e­dy pod­cast called The Flop­cast, where he and co-host Korn­flake dis­cuss fun­ny music, old car­toons, nerdy con­ven­tions, 70s and 80s nos­tal­gia, and yes, chick­ens. The song “Dead Pup­pies” has been off-and-on the most request­ed song of all time on “The Dr. Demen­to Show”. That song is by a group called “The Ogden Edsl Wahalia Blues Ensem­ble Mon­do Biz­zario Band”, or for short “Ogden Edsl”. The pri­ma­ry man behind “Ogden Edsl” is Bill Fren­z­er. Oth­er clas­sic songs by Ogden Edsl include “Kinko The Clown”, “Daddy’s Mon­ey”, and “Idi Amin Meets Eydie Gorme”. More recent Dr. Demen­to Show hits by Bill Fren­z­er include “Les­bians On TV”, “I Want To Ride On Shania’s Train”, and “She’s Got A Tongue Like A Kodi­ak Bear”. In 2013, he released a song about Pres­i­dent Oba­ma called “Send In The Drones”. 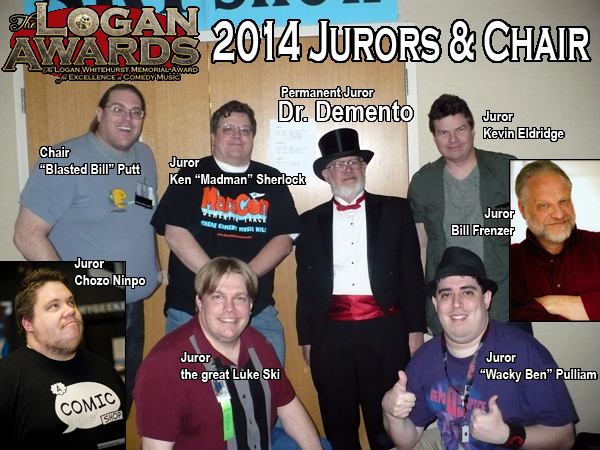 We are hon­ored to have such a leg­endary fig­ure from com­e­dy music his­to­ry as a juror for the 2014 Logan Awards. Bill Putt found­ed the 24-hour stream­ing com­e­dy music inter­net sta­tion “Demen­tia Radio” in 1999. Since then, it has become an online com­mu­ni­ty of like-mind­ed enthu­si­as­tic com­e­dy music fans, many of whom have become inter­net audio DJs them­selves, host­ing week­ly shows that hap­pen every night on Demen­tia Radio. A life-long fan of “The Dr. Demen­to Show” and com­e­dy music, Bill also orga­nized a con­ven­tion called “Demen­tia 2001″ in the Detroit area, a 3-day fes­ti­val with many com­edy music per­form­ers, and the site of the first ever Rocky-Hor­ror-style shad­ow­cast per­for­mance of “Weird Al” Yankovic’s 1989 cult clas­sic film, “UHF” (which Al men­tioned on the UHF DVD com­men­tary). Over the past two decades, Bill has been active in many assort­ed fan­doms relat­ing to com­edy music. He was a reg­u­lar cast mem­ber of the Detroit area’s “Rocky Hor­ror Pic­ture Show” month­ly shad­ow­cast per­for­mance; he was the Con Chair of Pen­guiCon, a fan­dom & pro­gram­ming con­ven­tion which fea­tures many fan­nish com­edy music acts; and has host­ed a hand­ful of stream­ing shows and pod­casts, includ­ing the “Toad Ele­vat­ing Moment” on Demen­tia Radio and the “Pod Of Des­tiny” with co-host Moon­beam Nance.